The “Action Network Human Rights – Philippines” (Aktionsbuendnis Menschenrechte Philippinen)* has conducted a two-day conference focused on the theme “repression against civil society in the Philippines”. Human Rights Matter was among some of the participant organizations attending. The participants and speakers consisted of Philippine civil society, people’s organizations, church leaders and think tanks (Karapatan, Philippines Alliance of Human Rights Advocates (PAHRA), IBON (think tank), TFDP, etc) and also consisted of international and civil society organizations such as the International Commission of Jurists and Frontline Defenders just to name a few. 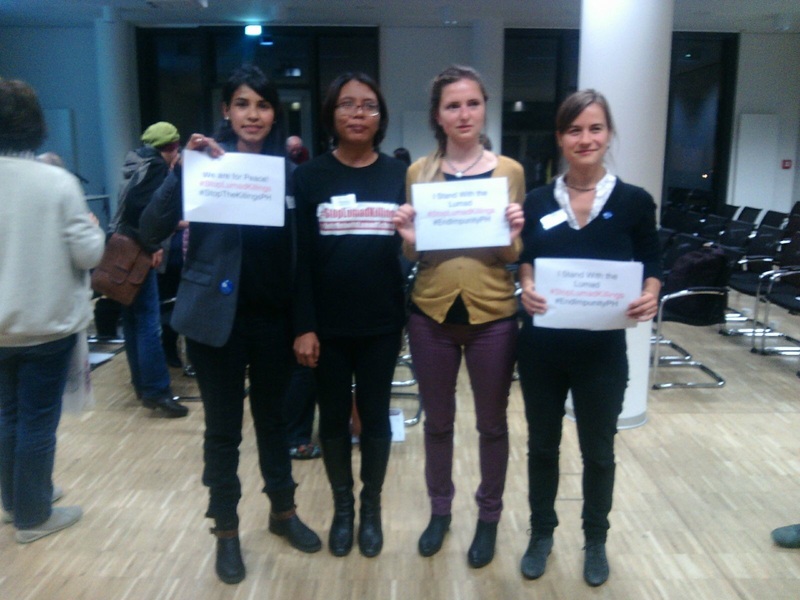 Among the topics discussed a big emphasis was put on the ongoing and increasing targeting of human rights defenders (HRDs) particularly those working on mining, agricultural sector and defending indigenous people’s rights (the killing of Lumad leaders in alternative school, which occurred on September 1st 2015 in the ALCADEV compound in Han-ayan and Km. 16, Brgy. Diatagon, Lianga, Surigao del Sur was one of the most recent examples). As discussed in the conference extrajudicial killings still occur as a human rights violation, however the current trend goes to the threatening, harassment and incarceration of human rights defenders as a preferred method which minimizes the wrongdoing of the perpetrators by criminalizing human rights defenders. Human Rights Matter believes that this form of attack is the most effective way of silencing human rights defenders, a tool used by the current Aquino administration to render HRDs useless and consider them as non existent. The current government, that was considered at one point to be a more democratic and human rights-friendly, now seems to be one who like many other governments only pays lip service to these ideals by claiming the non-existence of political prisoners and the diminishing of human rights violations. The numbers of reported cases by Karapatan are staggering: 537 political prisoners up-to-date as well as 133.599 threats, harassment and intimidations, more than 1.000 illegal arrests, 262 extrajudicial killings, 29.684 restrictions on the right of assembly and many other violations under the current Aquino regime. All these violations among others not mentioned are all strategic methods used to silence human rights defenders and weaken civil society. Human Rights Matter among others request from the German government through the federal foreign office to go beyond their comfort zone. We ask that officials yield to the pleads of the Filipino civil society organizations and that they play a leading role in lobbying other European Union countries to put pressure on the Filipino government, foreign interest groups and trade organizations. We at Human Rights Matter stand with the Filipino civil society and cry out for justice for the Lumad people, for the recent killings of Lumad and civil society leaders and for all Human Rights defenders who are facing trumped up charges, defamation and hit list namings! The struggle continues! Free Maridel Torres and her Baby! 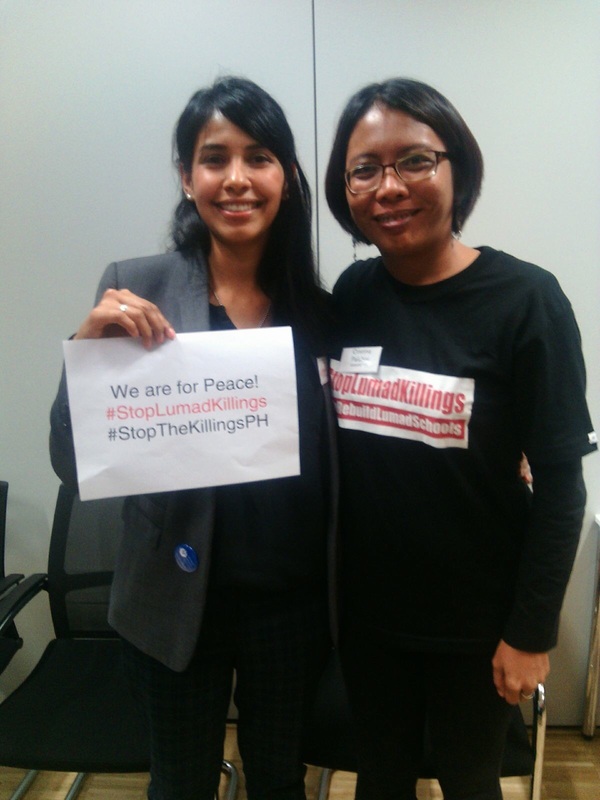 Brutal killing and harassing of Lumads in the Philippines must stop! Make a tax-deductible donation and keep the work going! A study by @rsfinternational found hostility towards journalism is rising and threatening democracies worldwide. Press freedom is being threatened all over the world, from verbal harassment to unlawful arrests and even murder. We need our journalists, we support our journalists, and we want an end to the climate of hatred! Tanggol Bayi, an association of women HRDs in the Philippines has strongly condemned the use of sexual violence against women in Duterte's drug war. Check our blog for the full story.